At ABC our aim is to provide elegance and finesse in the office facilities, and locations we offer. 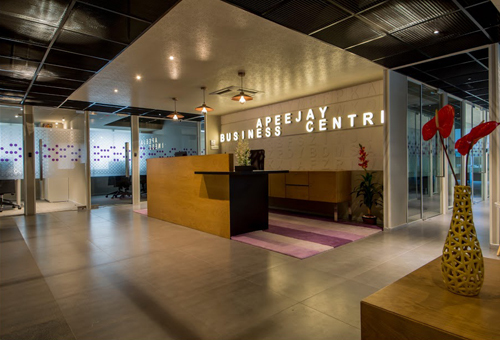 Our office spaces are designed to suit every need and requirement and offer an immense flexibility. Our professional and skilled team lends a personal touch to the service with their attention to details. Our office spaces are equipped with latest technology, best in class facilities, and excellent customer support infrastructure. We understand the dynamic and ever-changing needs of today’s busy and rushed business executives, and we are equipped to manage their needs in true international style. We know that the discerning customers expect nothing but the best, and we work towards providing the best consistently. ABC has invested significant resources in hiring the best team and latest technology to ensure that we meet and exceed the changing needs of our clients. We provide proactive customer service, which is truly the hallmark of ABC. We pride ourselves in our top class service, and also on the centrally located, well designed office spaces. Our centres are located in prominent and new office buildings. These are in most convenient and upmarket locations in any city that we operate. The products and facilities we offer in these locations are designed to meet the needs of both domestic and international clientele. We firmly believe that the success of our clients brings success for us and we do all that we can to provide you a conducive and professional workplace. Do connect with us to instantly get a warm, professional and hassle free workplace.